Hats are the perfect accessories for summer. Whether you don a beach hat, cowboy hat, fedora, or trucker cap, you’re shading your eyes, keeping your hair out of your face and protecting your scalp from sunburn. 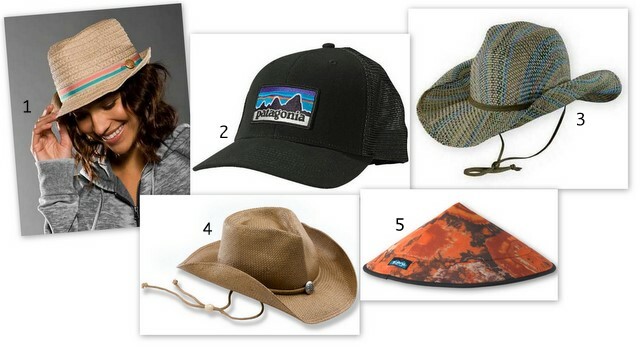 Here are a few affordable hats at our shop, but browse our full selection of men’s summer hats and women’s summer hats for more. This colorful fedora comes in a pinkish cognac or tan (pictured above) with a beachy ribbon. Such a nice twist on the standard fedora. I like this one so much I own one in cognac! You can’t go wrong with a classic mesh-backed trucker hat. This one keeps you cool and shaded, plus it looks great on both men and women. This woven raffia hat is a Western take on a beach hat. Wear it out on the sand, then don it to a hoe-down. The chin string makes this cowboy hat great for bike riding and indoor/outdoor events so you can wear it on your back when you’re inside. A cowboy hat for the active at heart, this Dorfman style is shapeable with an elastic sweatband to wick moisture. This is your classic cowboy hat without the bulk and weight. This modern rice paddy hat is a store favorite, and great for river floaters and Burning Man attendees. It’s hard to beat the shade this hat provides, plus its closed-cell foam construction is lightweight and won’t sink if you drop it in the water. 5 Under $50 is a monthly Tahoe Mountain Sports blog series dedicated to showcasing some of our more affordable products. Each month we pick a theme, then show you the gear.